This is where you can edit a single campaign. 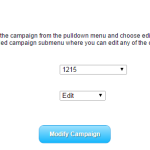 Select the campaign from the pulldown menu and choose edit, reset hits or delete campaign. If you choose edit, you’ll be taken to the campaign edit page in the detailed campaign submenu where you can edit any of the campaigns properties, check the traffic history, and other options.